As I’ve written about many times before, I like the idea of creative systems. Too many beginners have the idea that they know what they have to say–now if they can just find the words. 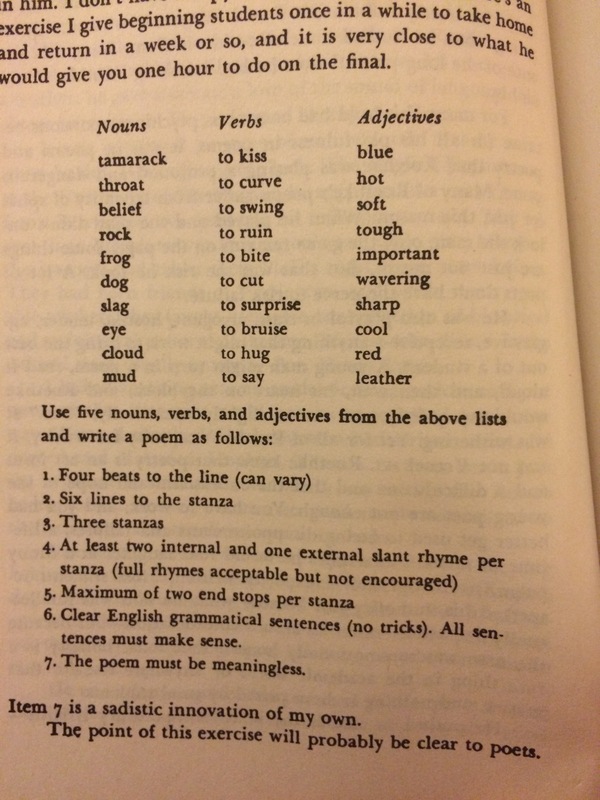 Here, you give them the words, some of them anyway, and some technical problems to solve. Many of them will write their best poem of the term. It works, and I’ve seen it work again and again. While the student is concentrating on the problems of the exercise, the real problems go away fro a moment simply because they are ignored, and with the real problems gone the poet is free to say what he never expected and always wanted to say (pg. 31). This week, I also gave my students an assignment with an hearty number of restrictions. The idea is to put your inspiration through the system of your craft, rolling around the creative restrictions. 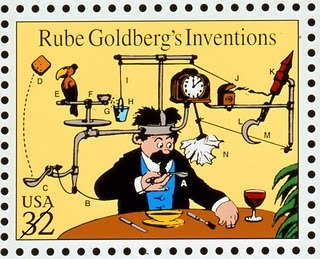 Think of a Rube Goldberg Device (funny name, serious sandwich). I first saw one when I was a young lad on the opening to a moralistic show about a boy with a cartoon friend only he could see. I liked this series NPR did called Music Project Song where they’d bring in songwriters—sometimes individually (as in the case with The Magnetic Fields’ Stephen Merritt), sometimes a team (Moby + Kelli Scarr), and sometimes a couple that have never even met before (Chris Walla (ex-Death Cab) and Jawbox’s J. Robbins). They’d let them choose from a series of pictures and a series of words, and then write an record the song in two days. The stuff of thrills.